Thunder. 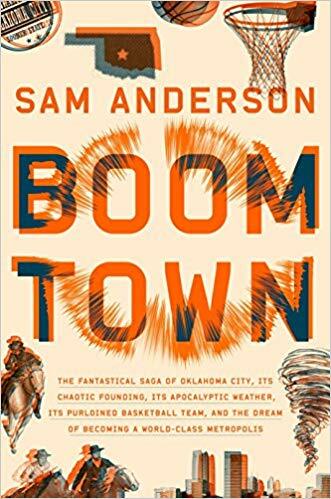 I had no particular reason to pick up a copy of Sam Anderson’s book titled, Boom Town: The Fantastical Saga of Oklahoma City, its Chaotic Founding... its Purloined Basketball Team, and the Dream of Becoming a World-class Metropolis. I have little interest in Oklahoma, and no interest in professional basketball. I followed the recommendation of a reader with that same incuriosity and I’m glad I did. Sam Anderson is a great storyteller and he alternates among a variety of story lines throughout this finely written book. Whether he is writing about the original land run that established Oklahoma City in 1889, or the travails of its pro basketball team, the havoc of tornadoes, or the bombing of the Murrah building, Anderson draws readers into the people and the place with great skill. I won’t necessarily visit Oklahoma after reading this book, and I won’t start following pro basketball, but I will look for Sam Anderson’s byline and anticipate terrific writing from this talented author. Rating: Five-star (I love it) Click here to purchase Boom Town from amazon.com.